"People tend to forget to eat salads and other raw foods in the cold weather. This salad is a good way to get your greens by combining somewhat heartier salad textures. I find that this salad is filling enough to be a main course, with a bit of bread or some rice cakes on the side. It will also work as an appetizer in a smaller serving." 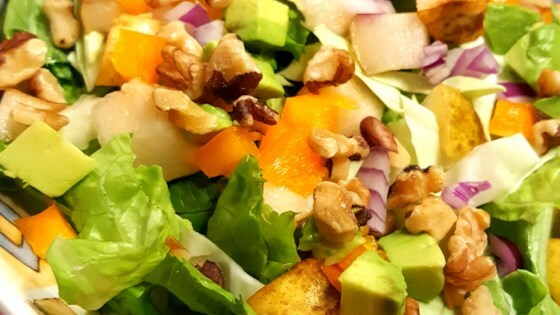 I just made the vinaigrette from this recipe and added it to my salad along with avocado. It is delicious! I'm never buying store bought dressing again. Fresh is so much better! Best salad I have ever had! Used kale and regular mixed salad and toasted almonds instead of walnuts. I made this incredibly delicious salad as a main dish. There were no collard greens available so I used a little more kale. The salad is full of texture and flavour.